* If the season continues according to the trendlines of the first four games, we're going to see Jimmy Graham's name show up often in this section. For the second consecutive week, Graham topped 100 yards receiving on 14 targets, 10 catches, 132 yards, and 1 TD. Graham has emerged as the Saints' top downfield threat and he's consistently rendered opposing defenses incapable of defending him. At this point, to simply define Graham as a tight end is a misnomer, as his role as a multipurpose receiving threat is transcending the traditional definitions of the position. Lining up in a wide variety of formations and responsible for an equally diverse assortment of route assignments, Graham just might already be the NFL's premier tight end. * The Saints' running game turned in an exceptional performance with 177 yards on 34 attempts, an excellent 5.2 yards per attempt average. Darren Sproles, Mark Ingram, and Pierre Thomas all contributed to a balanced attack that enabled the Saints to dominate the time of possession, limit the Jags' opportunities, and protect the lead. Furthermore, the emergence of the rushing attack is a promising sign as the Saints continue to evolve offensively. The multifaceted skill sets of the Saints' RB fleet pose an additional layer of defensive responsibilities, as opponents are not just forced to defend the Saints' elite passing game and the possibility of a complementary running attack. Instead, opponents must devise schemes to contain a layered rushing attack that combines the in-between-the-tackles power game (Ingram), draws/delays/misdirections (Sproles), and the traditional roles of an every-down back (Thomas). 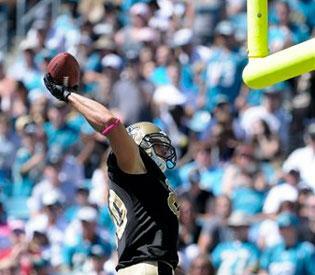 * The Saints' 3rd and 4th-down defense again proved its mettle on Sunday. 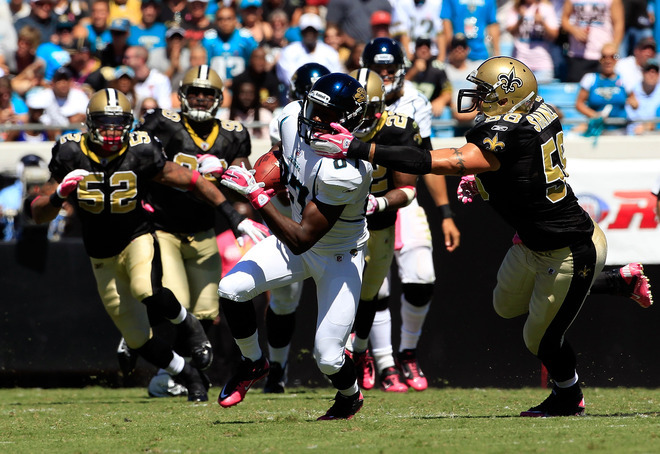 The defense limited the Jaguars to a combined 4-for-19 on 3rd and 4th down attempts, a paltry 21% conversion rate. As the Saints defense continues to shore up its shortcomings and develop its identity going forward, the ability to get off the field is a promising sign. 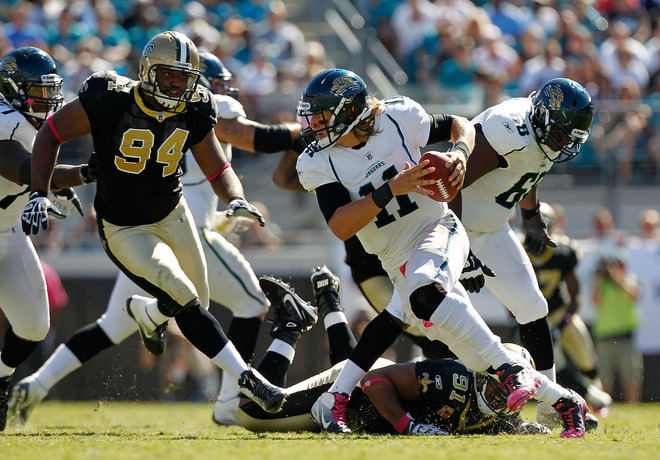 Against both the Jaguars and the Bears, the Saints' defense has excelled on third down. Against the high-powered offenses of the Packers and the Texans, the Saints' 3rd-down defense has not performed nearly as well. But it's meaningful and notable that the Saints have shown the ability to play excellent defense on third down for a portion of the season thus far. Developing this as a defensive strength (excellent 3rd down defense) will be a critical factor in the Saints ultimate success in 2011. * The turnover margin continues to linger in negative differential. Brees threw two more interceptions on Sunday--his second consecutive week of doing so--and the defense managed to force just one turnover against a rookie QB on an offensively-limited team. Saints' defenders dropped what seemed like three or four interceptions, and the failure to seize upon turnover opportunities is a poor indicator (anyone remember Malcolm Jenkins' dropped INT against the Bears?). The Saints have lost the turnover battle in three of four games, and that's not generally indicative of consistent, winning football. That the Saints have been able to overcome this shortcoming is a testament to the team's ability and resilience, but it's an area that needs continued focus and definitive improvement if the Saints intend on winning the NFC. * Two third-down penalties by Scott Shanle might just be me nit-picking what was mostly an excellent defensive performance by the Saints, but each penalty was costly. Early in the second quarter, Shanle was flagged for a facemask on 3rd and 20, gifting the Jags a first down in an otherwise untenable spot. Why Shanle was even on the field on 3rd and 20 is another discussion but regardless, five plays later the Jags scored to cut the Saints' lead to 14-7. Then early in the fourth quarter with the Saints protecting a 23-10 lead, Shanle was flagged for defensive holding on 3rd and four and, in the process, negated a Cam Jordan sack and provided the Jags with another opportunity to mount a comeback. * Thankfully for the Saints, there's not much to report in this section other than the cocktail service in Everbank Field. For a majority of the 3rd quarter, my cousin and I watched the game on a monitor while we waited in a not-very-long line for a drink. If there's one thing Jacksonville can learn from New Orleans, it's efficient delivery of in-stadium beverages. Doesn't Jacksonville host the world's largest outdoor cocktail party? Better tighten up, Jacksonville.